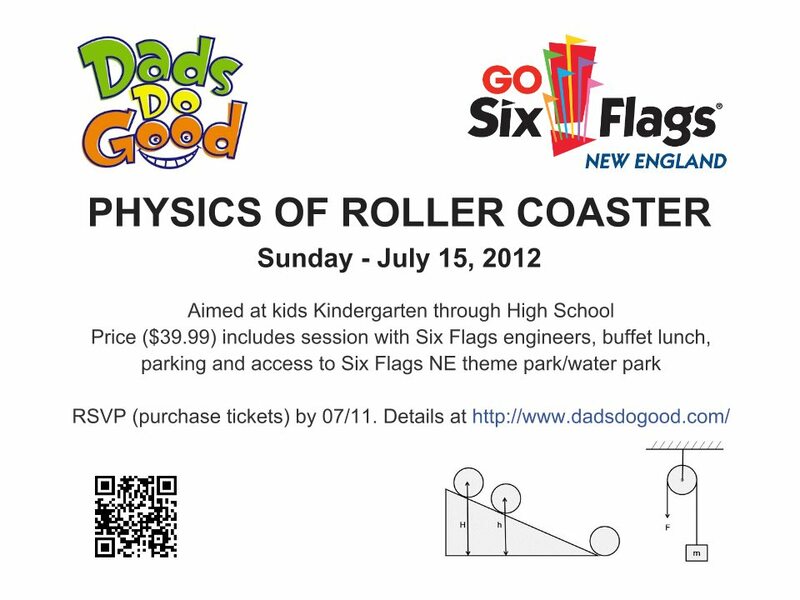 Dads Do Good is partnering with Six Flags New England to host “Physics Of Roller Coaster” on July 15th, 2012. RSVP (purchase tickets) by 07/11. Details here. Coaster Physics App for iPhone, iPad and iPod Touch. $.99. hat are the laws of Physics governing the motion of a roller coaster? How are speed and acceleration related? How does the g-force change at different points along the track? Click on image to view at iTunes. Great Timing! I’ll have to check the app out tonight with my eight grader who is going to Six Flags for the Bigelow class trip tomorrow. It’s geared for middle school-ish aged kids but my 7-year-old likes to play on it. The app is great in that it has a wide range of bells and whistles for almost any age. My little boy would play with it probably much differently than your child, but both would have fun.